Who doesn't love a good gumbo, right? We love it, and love to make it about as much as we love to eat it. (Ok eating it is way better, but making it is fun too!) 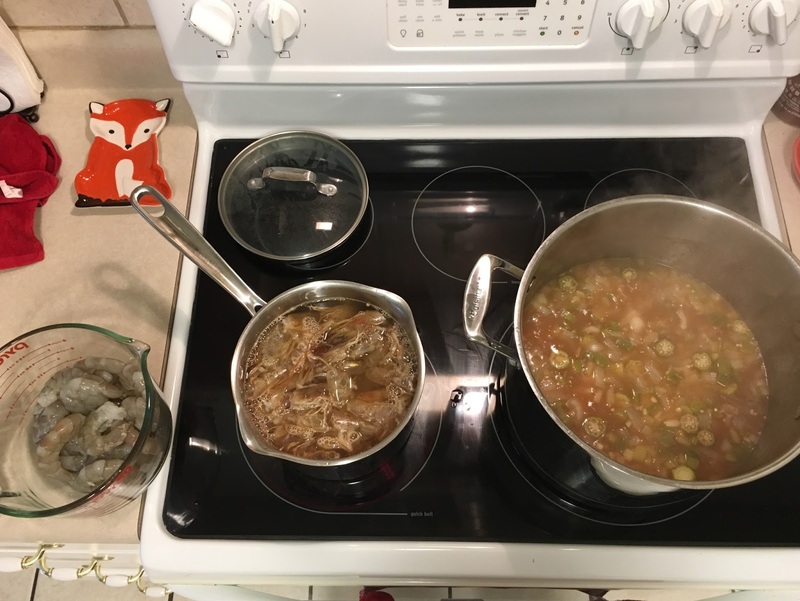 Many moons ago I actually make a post about our gumbo, 5 years ago to be exact, you can see it here if interested. We haven't deviated from this recipe very much over the years, but have made some tweaks. The biggest change this time is we used Alabama farm raised shrimp from Sumter County Shrimp. This was their first harvest year, ending in November. Unfortunately, harvest season is over but I am very much looking forward to next year. I had never had farm raised southern shrimp before, but it is DELICIOUS. West Alabama has very brackish ground water, apparently perfect for raising shrimp. They are slightly sweeter tasting, have lower sodium, and are all around far far better than imported shrimp (who knows how they raise that). It's even better than Gulf shrimp because of the lower sodium content. Did you know "fresh" gulf shrimp are often not actually fresh-never frozen because they freeze them on the boat, using salt water to freeze them? I didn't know that. So, see link above to their Facebook page, follow them to get updates, and get ready next year for some tasty fresh shrimp! They sell at the farm in West Alabama and this year sold in Tuscaloosa. Oh, and the shrimp were super jumbo size this year, so even better! Here I am after picking up my first order - one very happy customer. Yes, first order, meaning I had to go back and get more! We love shrimp, and have no shortage of freezer space in our big freezer, so why not! I'm in Tuscaloosa all the time for work (Roll Tide! ), so was fortunate to be around during harvest on multiple occasions. These guys below were alive and swimming around the day before. They are on ice to keep them cool because of my nearly 2 hour drive. See the shrimp up there in the blog header at the top of this page, sitting on top of tasty looking grits? Sumter County Shrimp. Stay tuned for that recipe! On to the gumbo. First things first, prepare some shrimp if you have the with shells/heads on. Second, brown some sausage. I got andouille sausage, all natural, no nitrates or nitrites, from Whole Foods. We always brown it in a separate pan than the one we'll use for the gumbo, in case it's an especially greasy batch. Next, chop up the veggies. I'm not a celery person, meaning I think it tastes gross when raw, or if not cooked enough, but when cooked in something like a soup or gumbo I don't mind it at all and it adds to the overall tastiness of the dish. So if you hate celery like I do, don't skimp on it. 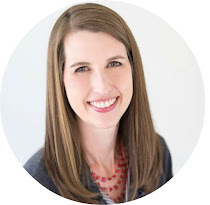 It will be OK.
As always, I am a strong proponent for getting your act together before you do any cooking, as things always go more smoothly that way. Measure it all out, and get it handy near where you will use it. Read through the recipe too before you start so you don't miss anything! TIP - sift your flour as you add it to your pan. It's just better and will make a smoother roux. I used canola oil for the oil, but plain vegetable oil is fine too. 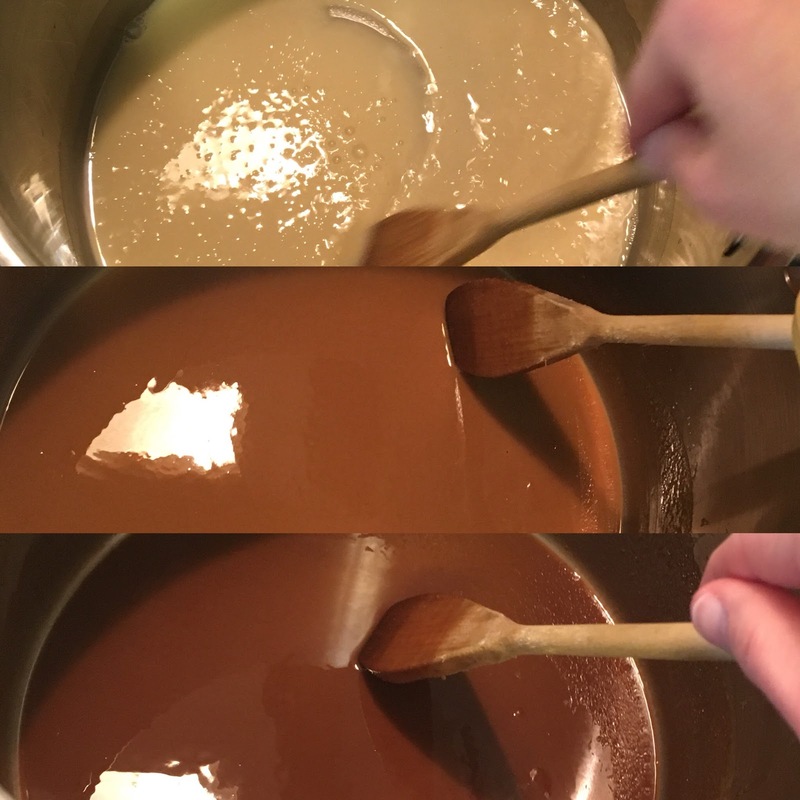 Making a roux is almost an art. There is no right or wrong way, and everyone has a different preference. Usually the darker the better, but too dark and you've burned it, and that is not good eats as Alton Brown likes to say. The key is to keep stirring constantly, and watch your heat. You may need to turn it down if it starts changing color to fast. The roux below I cooked for 15 minutes. We have an electric cooktop, so I actually lifted it up off the burner quite a few times if I thought it was going too fast. Gas reacts more quickly to heat adjustment, so you probably would not have to lift up the pan like I do. Next up, add in your other stuff, cook a bit, then add in water or shrimp stock. TIP - stuff can splatter, so wear an oven mitt to avoid getting splatter burns! After it's incorporated you should be fine. simmer simmer simmer. Simmer with cover on. Sidebar - I froze some of my Sumter County Shrimp just straight up with their heads and tails on (out of sheer laziness, generally you want to remove the heads before you freeze, but I'm still here.....). So, I had heads and shells, and made a quick stock. 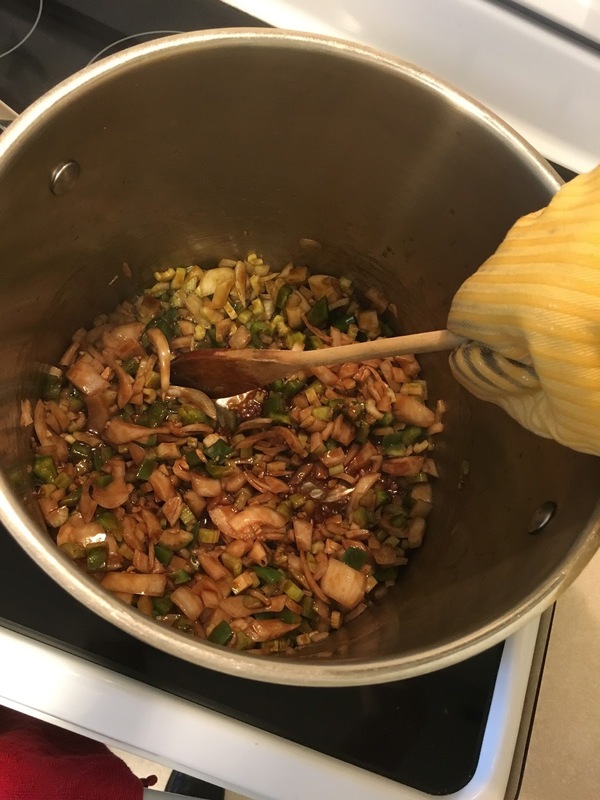 I used the onion skins and extra celery from the gumbo prep, and threw in the heads and shells. I let it simer for about an hour. Foam will rise up to the top at the beginning, just skim it off and discard. Below - shrimp, stock making, gumbo making. Final step - Add in shrimp and sausage. Get ready to eat!! I use good ole plain white rice as the base. We rarely eat white rice, usually use brown or wild, but for gumbo kept it traditional. Combine flour and oil in a large heavy bottom stock/soup pot, over low to medium heat, stirring constantly until roux is dark, 10-15 minutes. Add onion, celery, garlic, and green bell peppers to roux. Cook 2-3 minutes, stirring constantly. Gradually add warm water (or stock), blending well after each addition. Add okra and tomato sauce. Bring mixture to a boil. Reduce heat and simmer for 1-1/2 hours, stirring occasionally (approx every 20-30 minutes). While gumbo is simmering, cook the sliced andouille sausage in a pan over medium heat to brown. Drain off fat and pat dry. You can also do this first if like me, you were using your stove top to make stock while the gumbo was simmering. But do it in a separate pan than the gumbo, and brown first before adding even if it's pre-cooked sausage. Stir salt, black pepper, cayenne pepper, andouille sausage, and shrimp into gumbo. Bring gumbo back to a boil and simmer for 10 minutes or until shrimp are cooked. Remove from heat. Serve in a bowl over rice with chopped scallions on top. If freezing any, let totally cool in the refrigerator first, then freeze. This recipe also works great doubled if you have a crowd or want to freeze a bunch for later.